What's your first Walkman memory? Today, the Sony Walkman turns 35 years old. The Walkman is, therefore just a year younger than I am, and I certainly feel like we've grown up together. Since the original Sony TPS-L2 was introduced in 1979, Sony has sold somewhere in the region of 220 million Walkmans, and it's still selling them today. I am not exaggerating when I say that the Walkman was the product that made Sony into a global name. If you weren't there, it's hard to explain just how much those of us who were lusted after the Walkman. From Sony's first models, through to that yellow one you could take in the shower, the Walkman range was THE gadget of the 80s and 90s, and we all wanted one like the kids want smartphones today. More, even. We're back in time, it's around 1988 and I'm visiting my friend David at his home. We're stood in the kitchen, and David has a Walkman in his hand with a cassette loaded full of Ray Parker Jr's Ghostbusters theme song. He plays me a bit and my mind is completely blown. Not just because of how amazing that tune is, but also because it's coming from a box little larger than the cassette itself. How is this possible? This was life-changing for me, who knows, it might have been one of the things that kick-started my life-long love of gadgets. But before long, David's mother whisks the Walkman away. "It's EXPENSIVE! Don't touch!" The Walkman remained elusively expensive for quite some time, and was out of my reach as a youngster as it was for many people. It was the iPhone of its day for sure. I don't think I got a Walkman of my own until the mid-90s, but I do remember the machine. It had a large, lozenge-shaped play button on a the side, and took two AA batteries which it smashed its way through in no time at all. It was a very cool gadget though, and you have to remember that the combination of a ghetto blaster at home, and a Walkman for going out, meant that you could now record your favourite songs off the radio and take them with you. This was life changing for youngsters of the day. We were the first generation to be able to do this, and it's not overstating the issue to say it changed music, and how people listened to it. It also scared the willies out of the music industry, which for the first time was facing a threat to revenues from kids with dual-deck home systems making bootleg copies of albums while also recording the Top 40 off the radio to avoid having to buy singles. Anyone in their 30s will remember building compilations on a Sunday night, fingers hovering over a pause button to grab every second of the best songs. And it all sparked a now-laughable "home taping is killing music" anti-copyright infringement campaign. As the 90s went on, and the music CD became the format to own, the Walkman range transitioned to Discman, but soon reverted when Sony realised that the name Walkman had become as recognisable as its own four letter moniker. Walkman was as synonymous with portable music as the iPod would be 15 years later. I had a Discman too and it, along with a copy of Michael Jackson's Dangerous, changed everything. The King of Pop knew how to make a beautifully produced record and CD really was the only medium to listen to that album on. Things started to wobble for Sony a bit in the 2000s, we saw the move to Minidisc, a great format in many ways, but not one most people showed much interest in. The sound quality had evolved, but sadly the process for making compilations was still convoluted and we were back to hovering over the pause button to start recordings. Later on, Minidisc would gain the ability to work directly with computers, and music could be digitally transferred, but it was too late for the format really and despite being loved by those who used it, it was killed by the MP3 player. Of all the music players I've ever owned, the Sony NW-HD5 MP3 player is, without doubt, my favourite. It was a touch illogical, in that it required some utterly hopeless software to work, and files would be copied in Sony's ATRAC format. But the HD5 was perfection in audio terms, the best sound available on an MP3 player at the time - easily beating the iPod. I still have it, it's sitting next to me now and it has battle scars and looks well-loved. I'll keep it as a memento forever. After all this I even went on to own a Sony W800i Walkman phone, and until it broke, it was a brilliant pre-smartphone handset. It was a garish white and orange, but it was a really nice mobile and could store enough music for my commute to and from work. It basically started me and many others down the road to using a phone for music instead of a Walkman, and that has never been reversed. In short, it is the phone that holds the bloodied knife that was used to stab poor old Mr Walkman while he peacefully slept. There are still some cool products coming out with Walkman written on them, too, like Sony' new high-quality players. But really, the stand-alone music player has had its day, and even Apple admits that its phones and tablets are eating the iPod alive. There are lessons here for Apple. Sony went from being the global leader in electronics to making a loss of £685 million in 2008, the year before it made its last tape-based Walkman. It's only just on the mend now, thanks to some more great products, but the product that made it great is effectively no more. 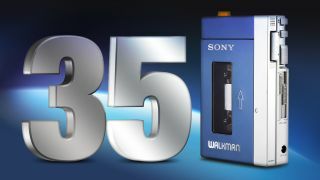 Happy birthday Walkman, and thanks for the memories.